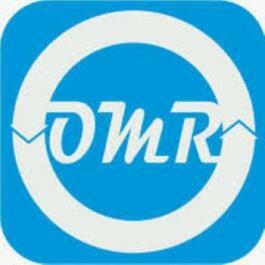 INDORE, INDIA, October 16, 2018 /EINPresswire.com/ — According to OMR analysis, North America e-commerce retail market is expected to grow significantly during the forecast period (2018-2023) coupled with increasing retail e-commerce sales. Additionally, North America e-commerce retail market is segmented on the basis of end-user, product, device and regional outlook. The report provides detailed & insightful chapters which include market overview, key findings, strategic recommendations, market estimations, market determinants, key company analysis, market insights, company profiling, market segmentation, geographical analysis, analyst insights and predictive analysis of the market. Increasing retail e-commerce sales is expected to witness remarkable opportunity for the market growth. According to the Census Bureau of the US Department of Commerce, the US retail e-commerce sales in the second quarter of 2018 was nearly $127 billion. It represents a significant rise of 3.9% from the first quarter of 2018. In the second quarter of 2018, e-commerce sales held 9.6% of total sales. This rise in e-commerce retail sales is primarily led by increasing smartphone adoption and high awareness about e-commerce in the country. According to the US General Services Administration (DigitalGov. ), with the introduction of I-phone a decade ago, the adoption of tablet and smartphone has increased significantly with 378 million mobile devices were in use in 2015. In addition, Google reported that significant number of google searches occur on mobile devices compared to the computers across 10 countries, such as the US and Japan. In Decemeber 2016, smartphones and tablets held 43% of all traffic compared to 36% in December 2015. This is demonstrating that there is a significant awareness in the country regarding the use of internet and smartphone, which encourages the consumers to use shop online using mobile devices. 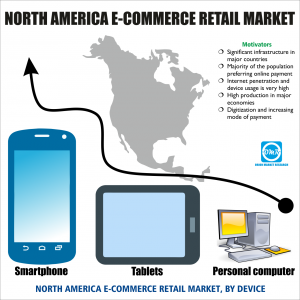 As a result, it is contributing to the growth of North America E-Commerce Retail Market. Furthermore, increasing mode of payment is facilitating the use of retail e-commerce options, which is also expected to boost North America e-commerce retail market. Now, it’s easy to pay through different modes such as credit cards, VISA smartcard and PayPal. These platforms provide flexibility to the users to make payment safely and easily, which is one of the major causes of increasing retail e-commerce sales in the US.